Phil Robertson is speaking out after Facebook removed a video of him cleaning and preparing a duck that he hunted. Facebook censored the 71-year-old hunter and businessman's video from his CRTV show "In the Woods With Phil" by stating, "This video may show graphic violence or gore." The hunter and patriarch from A&E's "Duck Dynasty" showed people how to clean and prepare a duck in order to make gumbo before Facebook censored the video. "Graphic violence? Where do these people think their food comes from," Robertson wrote before promoting his CRTV show with a link. "Are you sick of being told God's name and your way of life need warning labels?" CRTV is a $99 per year digital service where Robertson's show is available along with shows from Mark Levin, Michelle Malkin and Steven Crowder. Robertson previously told The Hollywood Reporter that he would use the platform to express his conservative political views after A&E suspended him for his comments comparing homosexuality to beastiality. "If liberals and Hollywood elites are going to pressure a network and advertisers to abandon me for saying something that is common sense as 'You need to be a boy to be a Boy Scout,' then I am going to go where they can't silence me," he told THR. "I have never been one to shut up." While a number of people have been protesting in today's political climate, Robertson said he doesn't see himself joining in anytime soon. "I've never seen anything rise to the level yet that I need to protest it," he said during an interview on "Varney & Co" this week. "I'm just listening and looking, I'm like, 'No I'm not getting out in the street with a sign over my head.' I'm not that fired up about it." Gaston Mooney, senior vp of CRTV, said he is proud to have Robertson on his team to share his values and spiritual views. "Our culture and values are being overrun and progressives are hell-bent on purging traditional values from media," said CRTV senior vp Gaston Mooney. 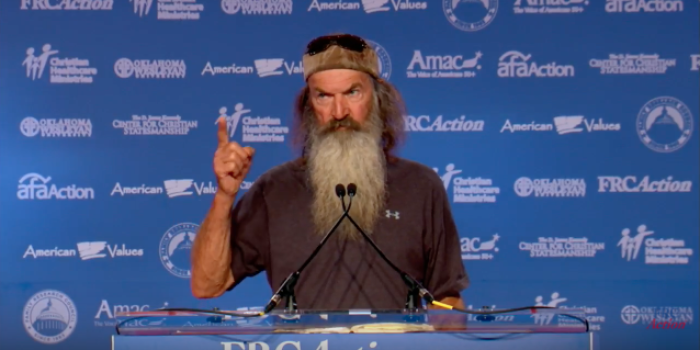 "Phil is a Christian and CRTV is proud to have him proclaim from our platform."